Winston Churchill said, "History is written by the victors." There's a lot of truth to that. But it's also true that sometimes leads to the whole story not being told. On the other hand, the Internet wasn't around in Churchill's day, but today one can read alternate histories and theories of history on just about any subject. Such is the case with the Milwaukee Road's Pacific Extension. Most who are even vaguely familiar with American railroading know of the Milwaukee Road being the only American "transcontinental" line to have been mostly abandoned. Several sites online claim to explain why this happened. As you read these, you will likely detect a common theme: A railroad that had everything going for it, with superior operating characteristics. As an example, an online source "A brief review of the failure of the Milwaukee Road" probably says it best in its opening statement, "The Milwaukee Road was well built, with the shortest and lowest-cost route to the Pacific Northwest. It was innovative, pioneering not only in electrification, but also things like roller-bearings (greatly reducing rolling resistance), refrigerator cars, and high-speed passenger trains. Later it lead in hauling cargo containers, with three-quarters of the traffic from the Port of Seattle, and even as late as 1969 it opened the largest facility in the region for transshipping automobiles. Yet, it failed." The reasons for the "why" of the failure of the Pacific Extension run the full gamut from conspiracy to deferred maintenance to poor management. Nowhere is the concept entertained that perhaps its failure was due to it NOT having superior operating characteristics. And indeed it did not, and that it did not was not only a burden throughout its short life, but was why another entity did not step up and step in and save it. That the Milwaukee Road had no savior is particularly important because even if any or all of the reasons touted for its demise were true, were it indeed the "lowest-cost route to the Pacific Northwest," someone would have sought to retain it. Such was the case with the Rock Island, which declared bankruptcy in 1975, and ceased operation under that name in 1980, the same year the Milwaukee's Pacific Extension was abandoned. The Rock Island physical plant was probably in worse shape than that of the Milwaukee. As a former Rock Island dispatcher from the El Reno, Oklahoma office once told me, "Just about all of the track was 10 MPH; if any train had a meet with on line, the crew would die. We even had a train derail while it was stopped; the rail overturned underneath." Yet as bad as the Rock Island was, most of its most important main lines survived: Minneapolis/St. Paul to Kansas City; Kansas City to the Gulf; Kansas City to Santa Rosa, NM (all operated by Union Pacific); and Chicago to Council Bluffs (mostly Iowa Interstate). Others saw value in the Rock Island, purchased the lines, and upgraded them. This validates the value of the Rock Island's routes, regardless of the reason for deterioration. This also suggests that many had understood the Milwaukee's west end had no such value, except for short, truncated segments. The Milwaukee Road had the shortest routes. The Milwaukee Road Pacific Extension was needed. The Milwaukee Road Pacific Extension had a superior profile. The Milwaukee Road Pacific Extension was the fastest route. The physical plant of the Milwaukee Road Pacific Extension was on par with its competition. The partial electrification of the Milwaukee Road Pacific Extension made it the superior route. The Milwaukee Road deployed superior equipment utilization for its passenger trains on the Pacific Extension. The Milwaukee Road showed foresight in its discontinuance of passenger trains on the Pacific Extension. The BN merger eroded the Milwaukee Road Pacific Extension's superiority, and thus was responsible for its demise. The Milwaukee Road Pacific Extension did not benefit from Land Grants, as did its competitors. The Milwaukee Road Pacific Extension would be viable in present day. Technically speaking, the Milwaukee did not have the shortest route between the Twin Cities and Seattle; Great Northern, which had alternate routes throughout Minnesota and North Dakota laid claim to the shortest route. The reality was that most GN freight traffic used the route through Willmar and Kindred, which was slightly longer than the Milwaukee route. The preferred route for Northern Pacific freight traffic was via Helena and St. Regis, about 150 miles more than the Milwaukee or GN. Between these two cities where there were alternate routes, Milwaukee Road passenger trains operated via Spokane; Northern Pacific passenger trains operated via Dixon (Evaro Hill). In early 1961, the last year of the operation of the Milwaukee Road Olympian Hiawatha, the Olympian Hiawatha departed Missoula at 620 PM, one minute before the departure of NP's North Coast Limited at 621 PM. Yet, in spite of the NP train having to operate 99 miles further, it arrived Ellensburg two minutes ahead of the Olympian Hiawatha. In addition, the North Coast Limited had an extensive switching maneuver in Pasco where it separated cars bound for Seattle and Portland. The reason for the NP train being able to overcome the mileage handicap was higher overall track speeds throughout versus miles of very slow trackage on the Milwaukee in places like the St. Paul Pass, home to numerous high trestles and much curvature. The above list of city pairs shows the circuity of Milwaukee Road routes, that some major cities were reached only via long, branch lines, and the lack of alternative routes enjoyed by rivals GN and NP. The Milwaukee Road did have mileage advantages over Great Northern between, for example, cities in South Dakota (Aberdeen and Sioux Falls) and Seattle, but between core cities in the northern corridor, it is largely a myth that the Milwaukee had the shortest route. While Milwaukee Road did have very slight mileage advantages between Chicago and Seattle and Chicago and Tacoma over its competitors, the amount was insignificant and was easily offset by its inferior profile and infrastructure (lack of double track, CTC, and longer sidings). And while there really are no major metropolitan areas between Minneapolis/St. Paul and the West Coast, those that were considered to major traffic sources, such as Fargo, Grand Forks, Minot, Bismarck, Billings, Great Falls, Bozeman, and Spokane were only accessed by the Milwaukee on (usually) long one-way branch lines or not at all, but all locations were on major routes of their competition. Myth 2: The Pacific Extension: A needed entity? Starting Minneapolis (though much of the main line in Minneapolis proper is gone), the Milwaukee's main line to the west coast remains intact today as far as Terry, Montana (some 40 miles east of Miles City, cut back when the Milwaukee gave up operating its trackage west of the Ortonville, MN). From the Minneapolis area to Appleton, Minnesota, the line is operated by shortline Twin Cities and Western, and there is ample business, mostly related to agriculture (fertilizer inbound, grain outbound, and even some coal for sugar processing plants). At Appleton, the junction point with the former Great Northern branch from Benson, Minnesota to Huron, South Dakota, the line is operated by BNSF (formerly Burlington Northern) to Terry (the ex-GN route from Minneapolis through Willmar and Benson to Appleton is used by BNSF in lieu of operating on what is today Twin Cities and Western). The ex-Milwaukee main line across South Dakota has numerous grain shuttle facilities (capable of loading 110-car unit trains), fertilizer, ethanol, and other agribusinesses. Aberdeen, as it was in the days of the Milwaukee Road, is the location of the state's largest yard, marshaling traffic from the ex-Milwaukee line from Sioux City, Iowa and Sioux Falls, South Dakota via Mitchell. Compared to traffic handled by the Rapid City, Pierre, and Eastern railroad (ex-CP, ex-DM&E, ex-C&NW), and a few other shortline operators (such as Dakota Southern Railroad), ex-Milwaukee Road trackage (continues) to dominate South Dakota rail transportation today. The main line continues to serve numerous agriculture-related shippers west from Aberdeen to Mobridge; west of Mobridge, where the land is more arid, such facilities are less frequent, but do exist through South Dakota and the Southwestern corner of North Dakota. In other words, this part of the Milwaukee Road main line from Minneapolis to Terry was worth keeping, and even though the Milwaukee Road sought to jettison it, other entities, from shortlines, to the state of South Dakota to BN saw value in keeping it, and rightfully so. Terry, Montana is the junction point with BNSF's ex-Northern Pacific main line, so the ex-Milwaukee main as far as Terry is also the western outlet for traffic on this route. West of Terry, one gets a different impression of where the Milwaukee once ran. Clearly, those who saw no value it keeping (most of) it were just as prescient in perceiving its value as those responsible for keeping the route east of Terry. Unlike in South Dakota where the Milwaukee Road was the dominant carrier, its position as a latecomer is obvious in Montana, Idaho, and Washington. 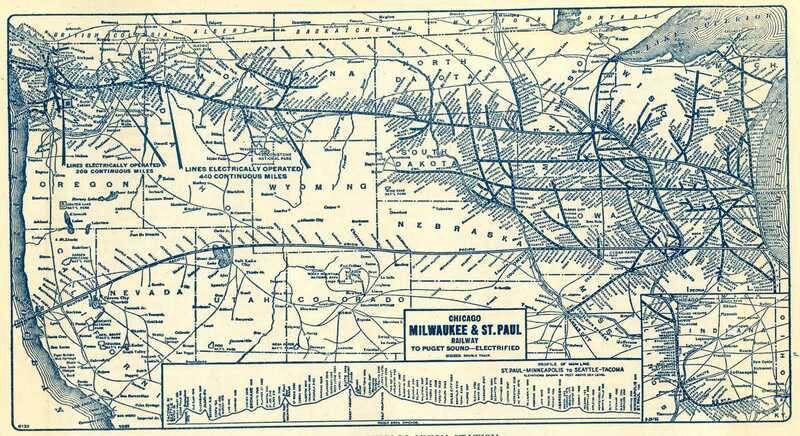 Not only was the Milwaukee not able to secure the best routes (as they were taken, mostly by the nearby Northern Pacific), but where they did choose to build, traffic was scarce; where the Milwaukee did serve a "major" city (by these states' standards, anyway), another railroad (or railroads) was already there, or access was via a circuitous branch line. The closest point on the Milwaukee main line to Billings was Roundup, where rail traffic was next to nil. At one point, the Milwaukee hauled coal from the Roundup area, but such was long gone by the 1970s. In 2009, a coal mine opened at Signal Peak, between Roundup and Billings. To access the mine, a railroad was built from the BNSF (ex-GN) Billings-Great Falls main line at Broadview. In a present-day scenario, this mine could have been accessed by the Milwaukee main line (were it still around), and would have provided a decent alternative to the current BNSF routing for trains destined to Chicago and Superior; however, most trains loading at Signal Peak today are destined to Roberts Bank, BC, where the Milwaukee routing would be inferior, or would be interchanged to BNSF anyway. The Milwaukee never built lines south from its main line at Forsyth to access coal mines at places like Colstrip or Sarpy Creek (Kuehn) as was the case with Northern Pacific. Harlowton was the junction point of the most notable branch line for the Milwaukee Road in the state of Montana. The Northern Montana lines served a sizeable agricultural area around Lewistown, with branches to Winnett, Roy, and Winifred. The main trunk continued northwest to Great Falls (largest city in Montana in 1960), and to the barley producing area of Teton County. All of these routes were flawed. The Winnett branch, the first to be truncated due to the lack of customer base (again, too arid east of Lewistown toward the "Big Open") had grades approaching 2 percent (more than a route Great Northern surveyed - but never built – for a route between Lewistown and New Rockford, ND). The branch to Winifred had grades of near 1.5 percent. The route between Great Falls and Lewistown was 17 miles further than that of the parallel Burlington Northern (ex-Great Northern) with a ruling grade eastward of 1.5 percent (versus 1.0 for BN) and 1.0 westward (versus .6 percent for BN). The line, built through coulees of creeks and rivers draining northward to the Missouri River, also suffered from unstable ground and required numerous high bridges and tunnels. Parts of the Northern Montana braches have the distinction of being the longest sections of Montana Milwaukee Road trackage to remain in service after the 1980 retrenchment. Sections retained were Moore to Lewistown to Geraldine (93 miles), Lewistown to Heath (10 miles - once part of a branch line that terminated in Winnett - to serve a U.S. Gypsum plant), and Fairfield to Choteau (18 miles). These lines all began being served by Burlington Northern; lines in the Lewistown area were accessed from the rest of the BN system by a branch off the BN's Billings-Great Falls main line at Moccasin; the Fairfield-Choteau segment was reached by BN's branch off its Great Falls-Sweet Grass main line at Power. The Moore-Geraldine and Fairfield-Choteau segments were part of the "main trunk" of the Northern Montana branches, 265 miles from the main line at Harlowton through Lewistown and Great Falls to Agawam. That part of the "main trunk" from Geraldine to Highwood to Great Falls was not retained is a testimony to many problems in that route, notably the bridges and unstable ground. That the line from Moore through Judith Gap – where an interchange with BN was available – and on to Harlowton was also not kept in service shows that indeed there was relatively little wheat in Wheatland County (county seat: Harlowton) to gather. After the BN assumed control of the ex-Milwaukee branches around Lewistown, a large wooden bridge east of Spring Creek Jct. was deemed unsafe; this would essentially isolate Lewistown from the outside rail network. Instead of repairing the bridge, the state of Montana funded construction of several miles of new rail line off the BN main east of Hobson to the former Milwaukee Road station of Sipple and on the ex-Milwaukee right-of-way to Moore where track remained intact to Lewistown. Also, the trackage west from Spring Creek Jct. to Geraldine (owned by the state) as well as the ex-GN branch line from Spring Creek Jct. to Moccasin (and connection to BN) became the shortline Central Montana Railroad. The Northern Montana lines were very representative of what was wrong with many Milwaukee Road branch lines in the West, and the west end of the railroad in general: Long branch lines with steep grades, circuitous routings for traffic, expensive infrastructure to maintain, and moving to today's railroading, the knowledge that many of the Milwaukee's routes would be even less viable today than they were when abandoned. The Milwaukee did have a decent one-carrier business handling malting barley from places like Choteau and Great Falls to Milwaukee, Wisconsin. But not all barley goes to Milwaukee; some went other places such as the Twin Cities where the Milwaukee route was 100 miles further than GN/BN with a maximum grade of 1.5 percent versus .6 percent for GN/BN (for cars from Central Montana to Duluth/Superior, the maximum grade on GN was also but .6 percent, but 2 percent for the Milwaukee, whose only access to the "Twin Ports" was via trackage rights on the NP "Skally" line and its horrible grade leaving St. Paul.) But wheat is the big commodity handled by rail in Central Montana, and in the last decade of the Milwaukee's existence in Montana, more and more wheat started going west to export on the west coast instead of east; today the trend is very much entrenched for shipments going west. In the fiscal year from July 2012 to June 2013, 90% of wheat and barley shipped from Montana by rail went "west". For that which could be shipped from Montana's Golden Triangle on the Milwaukee, that meant a huge mileage and grade (which will be discussed later) disadvantage. A car shipped from Great Falls, for instance, would need to be "backhauled" nearly 200 miles to Harlowton before starting its journey west. Two hundred miles from Great Falls westward on GN/BN/BNSF would put the shipment at Essex in Northwest Montana, already hundreds of miles closer to destination than any such car could achieve on the Milwaukee. And the destination of these cars is relevant, too. Today, as much grain is shipped in unit trains, the vast majority of wheat grown in Montana is shipped by such trains to the ports of Portland, Oregon, and to Vancouver, Kalama, and Longview in Washington via BNSF's (ex-SP&S) "water level" route through the Cascades (little Montana wheat goes to export at Tacoma or Seattle). Not only did the Milwaukee not have the advantage of such a grade-free route across Washington, but its route was via Tacoma, and then a circuitous branch line to Chehalis and then BN trackage rights beyond. With a whopping 350 mile disadvantage for shipments from Great Falls to Portland, it is inconceivable that the Milwaukee could have offered any type of competition as the implementation of the Staggers Act allowed railroads to compete by adjusting tariffs. And, as will also be discussed later, this is especially true when one considers the increasing train sizes of railroading today and the Milwaukee's inferior profile. The situation with the Central Montana Railroad over the past several years shows that indeed the Milwaukee would have been challenged (even more so) to compete. When BN turned the operation of the ex-Milwaukee lines (between Spring Creek Jct. and Geraldine, as well as the ex-GN branch from Spring Creek Jct. to Moccasin) over to the Central Montana Railroad, it agreed to pay a per-car subsidy to offset the cost of "backhauling" grain from Geraldine, and to a less extent, Denton, to the BN/BNSF interchange at Moccasin. This would not be unlike a subsidy necessary to make a present-day Milwaukee Road competitive moving this grain first to Harlowton before going west. By 2009, shipments off the Central Montana Railroad plummeted over half from previous years due to the preference for those in Agribusiness to truck their grain to Shuttle facilities on BNSF at Carter, Moccasin (Grove), and Moore rather than ship via the Central Montana due to the lower cost. At the same time, the per-car subsidy BNSF was paying had increased 350%. Also in 2009 an arbitration panel ruled that BNSF did no longer need to pay the subsidy. In 2011, flooding damaged the Central Montana trestle over the Judith River between Kingston and Ware, isolating the few shippers remaining at Denton and Geraldine. After failing on two attempts to get federal funding for TIGER grants to pay for the repair of the bridge, the state of Montana stepped in with some if its own money and other federal monies ($4 million) to repair the bridge. Since the bridge has been out of service, two additional shuttle grain elevators have been constructed within 40 miles of Geraldine, at Kershaw and Tunis (on BNSF). As more and more farmers use the shuttle facilities, it will be interesting to see how much grain is actually shipped on the Central Montana Railroad, though if some is, it will also be unknown how it is economically feasible. The American Association of Railroads stipulates that when shipments involve more than one railroad, each must itemize the costs of shipping on their segment (Rule 11). The Central Montana refuses to divulge this information. BNSF is transparent with their costs to handle the grain from the Moccasin interchange point to the west coast; the question then will become how the Central Montana can afford to "backhaul" these cars 85 miles over steep grades, poor track, and with fuel-inefficient locomotives, and still be able to attract customers or cover their cost. Regardless of whether the Central Montana Railroad becomes transparent or not, the general consensus of many in the Lewistown area is that the primary push for funding (but not from local sources) for the bridge repair was to move the origin point of the "Charlie Russell Chew Choo" dinner/tourist train from Ware to Kingston (10 or so highway miles closer to Lewistown), and so patrons can enjoy the spectacular view from atop the Judith River trestle. In 2014, the "Chew-Choo" has only 22 trips scheduled, 10 of which are between Thanksgiving and Christmas. Westward from Harlowton on the Milwaukee main line all the way to Three Forks (114 miles) was mostly devoid of any kind of revenue producing business. Three Forks was best known for two things with regard to the Milwaukee Road: It was (until the discontinuance of the Olympian Hiawatha in 1961) the Milwaukee's gateway to Yellowstone National Park, and was junction point for a branch line to Bozeman and the Gallatin Valley (once the Gallatin Valley Railway). Both instances epitomize Milwaukee's shortcomings as being a latecomer. The Gallatin Valley is a prime agricultural area, and was first accessed by the Northern Pacific Railway. Indeed, its main line passes through the area's primary city, Bozeman. Three Forks is 31 miles distant from Bozeman on the NP, where the grade is mostly downhill westbound and only .8 percent eastbound. In contrast, the Milwaukee's Gallatin Valley branch required some 39 miles to traverse the territory between Bozeman and Three Forks with grades of 1.4 percent each way. The Milwaukee tried to promote itself as a way to get to Yellowstone National Park, but it was difficult to do since the closest rail station on the main line was Three Forks, nowhere near the park. And while the Milwaukee transcontinental line was completed in 1909, no good roads had been constructed to take passengers from Three Forks to the park. By the time a road was constructed in 1926, Union Pacific and Northern Pacific were well established as the primary railroads serving the park via their branch lines directly to the park boundary at West Yellowstone and Gardiner respectively. Once a road was available (along the Gallatin River, today US 191) to move passengers from Three Forks, the Milwaukee attempted to increase its share of Yellowstone Park business by building the Gallatin Gateway Inn (completed in 1927), just south of Bozeman Hot Springs, and accessible by rail off its Gallatin Valley branch line from Three Forks. The Gallatin Gateway Inn, while a beautiful structure to this day, was hardly a "gateway". Milwaukee passengers from Gallatin Gateway had to endure a nearly 90-mile trip to reach West Yellowstone (where their rest/meal stop was Union Pacific's station), before continuing to Old Faithful Lodge, financed largely by the Northern Pacific. The Milwaukee attracted but 8% of those who chose to come to the park by rail. Due to the onset of the depression in 1929, and then World War II, in conjunction with construction of better roads everywhere, none of the tourist facilities created by railroads near/in national parks were a huge financial success; yet the Milwaukee's late arrival and lack of geographic proximity made the investment in the Gallatin Gateway Inn (cost: $260,000) very questionable for a railroad that did not have the money to electrify "the gap" or install block signals for the entire distance on its transcontinental freight line. Between Three Forks and Haugan (near the Montana-Idaho border), the Milwaukee main line was in close proximity to the Northern Pacific Railway (later BN). Major (by Montana standards, anyway) cities served were Butte and Missoula. Butte was Montana's industrial center for much of the 20th century and was one reason the Milwaukee's Pacific Extension was constructed through that city. By the time the Milwaukee reached Butte, GN, NP, and UP were already there. The Milwaukee bowed out of Butte in March of 1980; later that year, the Anaconda Company would shut down its smelters in Anaconda and Great Falls. Today, BNSF operates a five-day-per-week local that pretty much handles all the rail freight traffic left to and from Butte, including the UP interchange at Silver Bow. The Milwaukee served large wood products plants in the Missoula area at Bonner and Schilling (as did NP). Today in Western Montana, Montana Rail Link (successor to the NP lines in the Missoula area) operates only one of its own trains east from Missoula daily (the rest are overhead BNSF trains). Local traffic in the Missoula area to or from the west is handled by through BNSF trains. And while no Milwaukee trackage remains in service in far Western Montana, MRL has also discontinued serving any of its branch lines in the area, a testimony to the relative dearth of rail shippers in the area today. "The Milwaukee's Northern Montana line from Harlowton to Lewistown and Great Falls and its branches actually produced more revenue than the Milwaukee's entire mainline from Miles City to Avery" is a sobering quote about the utility of the Milwaukee Road mainline across Montana from the book The Milwaukee Road by Fred Hyde. (Actually, revenue produced in the Missoula area on the Milwaukee Road was actually similar in volume to that of the Northern Montana Lines, but the point is accurate in reference to the general amount of online traffic, which was mimimal). Across Northern Idaho, the Milwaukee did enjoy a high degree of exclusivity, but for a reason: There was little reason for other railroads to build there. Still, a short line still operates the main line from St. Maries to an interchange with UP at Plummer. Plummer was the junction of the important branch line to Spokane. Unlike NP and GN which accessed Spokane (the largest city between Minneapolis and Seattle by far) directly, the Milwaukee did so via a branch line from Plummer to Manito, and then via trackage rights on UP to Spokane. Milwaukee also had trackage rights from Spokane to Marengo on UP to again access the main line which missed Spokane running directly from Plummer to Marengo. Though Official Guide entries by the Milwaukee continued to show two routes between Plummer and Marengo into the 1970s, the reality was that the Spokane-Marengo segment was mostly only used by Milwaukee passenger trains. When the Olympian Hiawatha was discontinued in 1961, so was the use of the UP from Spokane to Marengo, relegating the Inland Empire's primary city officially to branchline status on the Milwaukee. From the Spokane area, the Milwaukee had branch lines to Coeur d'Alene and Metaline Falls. All railroads to Coeur d'Alene are now gone, but part of the branch to Metaline Falls (from Newport) survives as the Pend Oreille Valley Railroad, albeit with minimal traffic. But when the Milwaukee was in existence, all the cement from Metaline Falls and lumber from Coeur d'Alene needed to be hauled up that 1.7 percent grade out of Spokane just to get the cars to Plummer for a main line pick up! The part of the Milwaukee mainline from Warden (a connection to the ex-NP/BN) to Othello survived the 1980 shutdown to retain service to this rich agricultural area (still in place was the part of the main line west of Othello to the junction of a branch to Royal City, and is owned by the state of Washington, which is trying to reinstate service). Also surviving in the Othello-Warden area was the ex-Milwaukee branch to Moses Lake, which had, as Mr. Hyde also described in his The Milwaukee Road book "more online customers between Tiflis and the old airbase (near Moses Lake) than there were on the entire mainline between Othello and St. Maries, Idaho." This statement probably could be applied to mainline west of Othello to the Seattle/Tacoma metro area, too. Ellensburg (also served by NP/BN) was the main intermediate city served, but it never generated the agricultural traffic enjoyed in places like the Tri-Cities or Yakima or Quincy or Wenatchee. Outside the mainline to Seattle/Tacoma, the Milwaukee had an extensive group of branch lines in Western Washington, most of which had severe operating characteristics of one sort or the other. The best examples are the lines from Port Townsend to Port Angeles and Bellingham to Sumas (and beyond). Both of these lines were initially reached from the Milwaukee main line in Seattle by ferry. The Port Townsend ferry was understandable as there was no other through rail line built to the Olympic peninsula, and this service actually survived the 1980 shutdown (The Seattle and North Coast Railroad). Operational handicaps on the Bellingham line again was simply as a result of the Milwaukee being the last railroad to enter the market with no other available routes on which to build. In the 1950s, the Milwaukee dropped the ferry to Bellingham in lieu of paying Great Northern to haul its cars from Everett (reached by another branch from the Milwaukee main line at Cedar Falls) to Bellingham. In the 1970s, the Milwaukee received trackage rights from Black River to Everett on Burlington Northern via its ex-NP line from Black River to Snohomish. While this line was more direct from the yard in Tacoma than the Cedar Falls branch, the ex-NP "Eastside" line had a terrible hill at Maltby, with a grade around 1.7 percent in both directions. Meanwhile, BN trains on their mainline via Seattle and Edmonds used a route that was basically flat. On the bright side, this situation also allowed the Milwaukee to have trackage rights on the BN's ex-Great Northern line between Everett and Bellingham, for direct access to their line to Sumas and interchange with the Canadian Railroads. Still, regardless of the timeframe, movement of cars from the Milwaukee mainline to and from the Canadian border was exceptionally cumbersome compared to that of GN, or even NP. South of Tacoma, the Milwaukee's branch line network wasn't a lot better. Northern Pacific had secured the best areas to build branch lines, so the Milwaukee acquired logging railroad Tacoma and Eastern in an attempt to get some traffic to feed its main line. The main stems of the Tacoma/south "network" was through Frederickson (and a branch to Morton) and Maytown (with a branch to Grays Harbor jointly owned with UP) to Chehalis. From Chehalis, there were branches to Raymond, and trackage rights on NP to Longview. In 1970, as a condition of the Burlington Northern merger, Milwaukee was granted trackage rights on BN (ex-NP, ex-SP&S) from Longview Jct. to Portland, the second largest city in the Pacific Northwest. Like many of the Milwaukee's important branch lines, the one south (timetable west) from Tacoma had operational deficiencies such as circuitousness and short and infrequent sidings. But the overriding handicap was the five-mile long 3.6 percent grade between Tacoma and Hillsdale (en route to Chehalis), one of the steepest in American railroading. This grade was so steep, the Milwaukee was forced to keep helpers at Tacoma just for trains on this route and/or to move cuts of cars in sections for assembly when the grade was crested. This was in stark contrast to GN (later BN), NP (later BN), and UP trains using the NP double track main line from Tacoma south, where the maximum grade to Portland was only 1 percent. Moreover, heavier traffic from the east (such as grain) on GN, NP (later BN), and UP destined for places like Longview, Kalama, Vancouver, and Portland never passed through Tacoma anyway – it was routed along the water-level Columbia River lines (ex-SP&S and UP) rather than over the Cascades to reach Tacoma initially. The Milwaukee in Montana, Idaho, and Washington suffered from a main line with relatively little online traffic, fed by branch lines that were circuitous, steep, and/or of limited capacity. And while Seattle and Tacoma are important sources of rail traffic even today, they did not and today do not comprise the majority of traffic in the Pacific Northwest. That the Milwaukee was built to Puget Sound without a plan to effectively access Vancouver, British Columbia and Portland, Oregon and their vital interchange traffic was itself a prelude to failure. So, the Milwaukee's Pacific Extension didn't have a lot of online traffic, and while some of its branch lines did, gathering and marshaling into main line trains was expensive. But could the Milwaukee have survived simply on long haul traffic between the Midwest and Seattle/Tacoma? After all, "The Milwaukee Road was built to be the shortest, fastest, and lowest-cost route to the Pacific Northwest, with easier grades and curves than the Great Northern and Northern Pacific. Combined with the lower cost of electric operation, it was able to move freight at a lower cost than its competition," or such is the claim from a "history" of the Milwaukee Road at a website dedicated to hiking Cedar Butte near Cedar Falls, Washington (link below). That the Milwaukee Road was initially better engineered than the competition is pretty much meaningless in discussing the attributes of the individual railroads. This is actually a given considering the Milwaukee was completed 26 years after the Northern Pacific and 16 years after the Great Northern. One would expect engineering technology and equipment to improve as it continues to do so today. But the GN and NP subsequently made many line changes over the years – right into the 1960s – that more than made up for any shortcomings with regard to the Milwaukee, which made very few alignment changes after initial construction. And the "engineering" necessary to build the Milwaukee, in the end, also helped hasten its demise. It, by far, had the greatest number of very high, costly-to-maintain bridges on its route, 11 alone on the route over St. Paul Pass, which of all of the Milwaukee's many expensive grades, was surely its Achilles' heel. Numerous bridges on the west side of Snoqualmie Pass also influenced the decision to abandon that segment. As indicated earlier, the Milwaukee did not always have the shortest route, and indeed in most instances it was not the shortest with awkward routings at best. And shortest is not a guarantor of fastest or least expensive, especially when said railroad has the inferior profile and inferior infrastructure to promote efficiency. By far the greatest inefficiency facing the Milwaukee Road Pacific Extension main line was its profile. Much touted by proponents of the route was its gradual .7 percent grade westbound over the Cascade Mountains in Washington State (compared to 2.2 percent for GN and NP over the same mountains). However, what tends to be "overlooked" by the same proponents is the Milwaukee's 2.2 westward climb up the Saddle Mountains from Beverly, Washington, all its other severe grades, and that for the heaviest of trains, GN and NP could use (as BNSF still does today) the water-level SP&S route along the Columbia River to reach Western Washington (and of course, Portland, which the Milwaukee didn't reach until 1971). One way to show that indeed the Milwaukee was the "high cost" route (and show the reason that those with prescience back in the 1970s made no attempt to acquire the Pacific Extension) is to simply compare the amount of locomotive assets that would be necessary to move a train on each route. Locomotive costs are difficult to quantify, and include the initial cost of the locomotive, the age of the equipment and depreciation, type of locomotive, fuel cost and usage, and a wide range of maintenance costs from the facility itself to those employed there. Other huge costs, rarely mentioned in such discussions, is that of locomotive dwell (the locomotive not being used), locomotive velocity (how far the locomotive is used in a given period), and late locomotive power (the cost of holding a train because locomotives are not available due to delay). Then there is the additional cost of power modifications; the more the locomotive consist is changed en route the greater the cost because real people need to be used to accomplish these modifications, and there is also a cost to delaying the train while the modifications are being performed. Obviously, the least-expensive route is the one that requires the fewest locomotives overall and the fewest locomotive modifications en route. With all the variations that are possible with regard to locomotive usage and configuration, it's difficult to place an actual dollar amount on locomotive cost. So, what follows is an apples-to-apples comparison of how trains are handled on BNSF between the Twin Cities and Pacific Northwest today as well as a partial simulation of how they would be if the Milwaukee was still intact to handle such trains today. A "shuttle" grain train is probably the most common type of unit train BNSF operates today. 110 cars on average, about 16,000 tons, loaded at one location and unloaded in its entirety at a single destination. There are many types of locomotives, but the generic C44 (built by GE, DC traction motors) is the most commonplace. This will be the type of train and the locomotive used for the comparison; the origin point will be Minneapolis and the destination will be Tacoma. A shuttle grain train originating at Minneapolis on BNSF would be assigned the standard 3 C44 locomotives, and would be configured with 2 on the head and one on the rear, remotely controlled. This power is sufficient (actually the train could handle an additional 6,000 tons with the same power) to Havre, Montana, about 900 miles west of Minneapolis. The maximum grade is generally .4 percent, except for a short .6 percent climb just east of Nolan, ND and .6 to .65 percent between Minot and Temple, ND (86 miles). At Havre, a fourth C44 locomotive is added to the rear of the train, and the train departs with 2 units on the head end and 2 on the rear. The first 1 percent climb is encountered about 10 miles west of Havre, and is more or less continuous for 45 miles to Buelow; from there to Shelby, 105 miles from Havre, the maximum grade is generally .8 percent, with two very short 1 percent sections. From Shelby to Summit (about 80 miles) the grade is nearly continuous 1 percent. A line change in the late 1960s east of Bison reduced curvature significantly but also increased the grade to 1.3 percent for very short distance. This is primarily the need for the fourth locomotive at Havre. The Continental Divide is crested at Summit its lowest point in the continental United States north of that of Union Pacific (ex-Southern Pacific) just north of the Mexican border in New Mexico. From Summit, it's mostly downhill to Whitefish, and west to Stryker, which is the junction point of a new line completed in 1970 around Libby Dam and Lake Koocanusa which would flood the GN's water level route through Western Montana. While the line change reduced the distance by 14 miles, it also created another short 1 percent climb between Brimstone and Twin Meadows, which is the east portal to Flathead Tunnel. From Twin Meadows, the line is mostly downhill, with short intermittent sections of .6 and .8 grade to Spokane. While the shortest route to Tacoma from Spokane for BNSF would be via Wenatchee, Everett, and Seattle, BNSF chooses to route all heavier trains via Pasco, Wishram, and Vancouver, WA along the water-level Columbia River. The maximum grade from Spokane to Pasco is .8 percent (departing Spokane), with another .6 percent at Providence Hill west of Ritzville, and from there to Tacoma it is mostly downhill with the maximum grade being .3 percent or less, except for 11 miles of "Napavine Hill" at .9 percent. At the discretion of the Locomotive Utilization Group, any grain train out of Havre with 4 locomotives in this "2 by 2" configuration can set out one unit at any point Whitefish or west, and this is done depending on local needs at Whitefish, Hauser Yard, Spokane, or Pasco. In summary, the train really needs 3 units Minneapolis to Havre, 4 units Havre to the Continental Divide, and then 3 to destination. A shuttle grain train originating at Minneapolis on BNSF would be assigned the standard 3 C44 locomotives, and would be configured with 2 on the head and one on the rear, remotely controlled. The ruling grade is generally .4 percent to west of Casselton, North Dakota (about 260 miles west of Minneapolis) where the first of many 1 percent grades is encountered (Peak, ND). Subsequent 1 percent climbs are leaving Jamestown (333 miles from Minneapolis), and numerous locations between Mandan and Glendive (546 miles from Minneapolis) including moving out of the valley of the Little Missouri River at Medora and for Beaver Hill. No additional power is required to operate trains as far as Glendive, but the locomotives must be distributed power configuration (such is not the case on the route from Minneapolis to Havre, where all power could, if necessary, be placed on the head end, which is sometimes necessary due to distributed power defects or using locomotives without such equipment). West of Glendive, the grade is a relatively steady .5 percent (following the Yellowstone River) to Livingston. West of Laurel, the trains are generally handled by Montana Rail Link, though operation north to Great Falls and the ex-GN main line at Shelby is an option if capacity is an issue. Regardless, the train departs Laurel/Mossmain with the same three units assigned at Minneapolis. At Livingston (MRL) the train will add a helper midtrain (three SD70AC locomotives or two SD70ACs and an SD40) for the 1.8 percent climb to Bozeman Pass. From atop Bozeman Pass to Townsend, it's all downhill, and the Livingston helper is cut out at Bozeman (24 miles from Livingston). At Townsend begins a 13-mile 1 percent climb to Winston, at which point, the railroad runs generally downhill into Helena. At Helena, MRL again adds a midtrain helper (four SD70AC locomotives or equivalent) for the 14 miles of 2.2 percent westward grade to the top of the Continental Divide at Blossburg. The railroad from Blossburg, most all the way to Sandpoint, with a few short exceptions, is downhill. The helpers added at Helena are cut out at Elliston, 29 miles distant. Sandpoint to Spokane has a short .8 grade. While the shortest route to Tacoma from Spokane for BNSF would be via Wenatchee, Everett, and Seattle, BNSF chooses to route all heavier trains via Pasco, Wishram, and Vancouver, WA along the water-level Columbia River. The maximum grade from Spokane to Pasco is .8 percent (departing Spokane), with another .6 percent at Providence Hill west of Ritzville, and from there to Tacoma it is mostly downhill with the maximum grade being .3 percent or less, except for 11 miles of "Napavine Hill" at .9 percent. This of course, is mostly a simulation due to the fact that most of the former Milwaukee Road Pacific Extension has been abandoned west of Terry, Montana. East of Terry, as far as Appleton, Minnesota, BNSF operates the former Milwaukee main line, so some current operational information is indeed available. A shuttle grain train originating at Minneapolis on Milwaukee would be assigned 4 C44 locomotives (one more than necessary on an ex-GN or ex-NP routing), and would be configured with 3 on the head and one on the rear, remotely controlled. Whether the train were to operate via the former Milwaukee main line via Glencoe and Montevideo or as it could now on BNSF (ex-GN) via Willmar and Benson, the same amount of power would be assigned, and the grade would be around .5 percent, which would not be exceeded through to Twin Brooks, SD. West of Twin Brooks is 13 miles of continuous 1 percent grade, only 197 miles (via an all-Milwaukee routing) west of Minneapolis. The crest of the grade is at appropriately-named Summit, South Dakota, and this is segment constitutes the need for four locomotives from origin. (Since BNSF has begun operating shuttle grain trains of this tonnage westward on the segment from Twin Brooks-better known on BNSF as West Milbank, home of a shuttle grain facility and fertilizer plant-numerous stalls have occurred with 3 C44 locomotives, so four is now the requirement. Most often, BNSF will prefer to route a loaded West Milbank shuttle train back east to Benson, then via the ex-GN route west via Havre to avoid adding the fourth unit at origin.) At Aberdeen, as is the case today for the limited number of trains routed this way, one of the four units would be set out (to be returned east) and the remaining three (two units on the point, one on the rear, distributed power) would continue west from Aberdeen, and the locomotive configuration would be the same as used across North Dakota on the ex-GN and ex-NP routings. West of Aberdeen, there are short .7 to 1 percent hills between Aberdeen and Java. West of Java, South Dakota to Terry, Montana, and all the way to Harlowton, Montana (transitioning from actual practice to simulation at Terry), the power remains unchanged as the maximum grade is .6 percent or less. At Harlowton, there are two scenarios for the Milwaukee to use. Fully power the train for the steepest hill, or run the power through and add power as necessary (mostly helper power) for each steep hill. Fully powering the train would be relatively simple; Seven C44s would be required for the steepest grade (Saddle Mountains), likely with two units on the point, three cut in midtrain, and two on the rear. This would be a time-consuming move at Harlowton (adding power to the DP unit on the rear, and then cutting more in the train), but overall less time consuming than addressing each individual hill. The seven units would continue to Kittitas, Washington – 717 miles distant – where the four units added at Harlowton could be removed, and the train could continue west with the original three units as the maximum grade beyond is .7 percent to Snoqualmie Pass, and then more or less downhill to Tacoma from there. Not full-powering the train from Harlowton would be much more complex, and shows the individual locomotive requirements of each of the Milwaukee's four mountain grades. The first grade west from Harlowton is Loweth, which until one of the Milwaukee's few right-of-way changes in 1956, was a 2.05 percent grade. A large cut reduced the grade to 1.4 percent. The shuttle grain train would need 2 additional C44 units at Harlowton, configured 3 on the point and 2 on the rear (adding one at each end of the train). While it would be possible to cut the power added at Harlowton at someplace like Ringling (and return it to Harlowton for another train), the most likely scenario would be keeping the 5 units on the train as they – and more – would be needed for the next hill (Pipestone Pass). From Loweth, it was nearly 50 miles of continuous 1 percent downhill grade to the Missouri River at Lombard, and from there to Piedmont (near Whitehall) there is a minimal westward grade. It's just over 100 miles from Loweth to Piedmont. At Piedmont, 18 miles of 2 percent grade starts to the top of the Continental Divide at Donald, or Pipestone Pass. Two additional units, brought from Butte, would need to be added (7 units total) midtrain (the train is too heavy to have all the power on each end due to drawbar restriction). At Butte, the 2-unit midtrain "helper" could be cut out, to return to Piedmont for another westbound train, or to be used to assist an eastbound train on the 1.66 percent grade from Butte to the top of Pipestone Pass. Butte to Haugan, some 213 miles, is largely downhill (river grade), except from St. Regis to Haugan, which has a moderate grade up to .8 percent westbound – easy work for the 5 remaining units on the train departing Butte. At Haugan, however, another 2-unit (C44) helper would again be added midtrain (much the same as at Piedmont) for the assault on St. Paul Pass, 1.7 percent. These units could be removed at Avery, Idaho (38 miles from Haugan). The train would then proceed from Avery to Beverly (250 miles, via Malden) with the original 5 units on it since Harlowton. The grade to Beverly is very moderate and often downhill, except for 15 miles of steady 1 percent from Ramsdell to Sorrento. Indeed, this part of the run, could be handled with the original three locomotives inbound at Harlowton. Beverly marks the start of the steepest climb westward on the Milwaukee Road, the Saddle Mountains, 17 miles of continuous 2.2 percent grade, the longest such grade in Washington State. At Beverly, two additional C44 locomotives would be required midtrain, to depart with seven; 3 on the point, 2 midtrain, and 2 on the rear, distributed power. The crest of the grade is at Boylston, and from there it's downhill to Kittitas. At Kittitas, the train could continue west with the original three units as the maximum grade beyond is .7 percent to Snoqualmie Pass, and then more or less downhill to Tacoma. The four units cut at Kittitas would need to be repositioned east to Harlowton and Beverly for subsequent trains. It's difficult to completely quantify locomotive costs as locomotives are different and territory is different. Even locomotive fuel prices are different at different locations. The actual way railroads keep track of their locomotives on another railroad is horsepower hours which is one horsepower offline for one hour. In the example of a C44, if offline for a day (24-hour period), the railroad using the unit would pay the home road 105,600 horsepower hours (or 4400 horsepower X 24 hours); the cash equivalent is about $1200. Of course, not all horsepower is the same, but is the method today's railroads use for keeping track of foreign power on their railroad. I will use a derivative of this to chart the cost of locomotive usage (assuming all locomotives are the same for this example) referred to as the "locomotive mile" or one locomotive being used one mile. This comparison uses the generic "locomotive miles" as a constant. The salient point here is that it proves the shortest route (the Milwaukee) is not the least expensive (because the BNSF routings include operating with a more favorable grade) and require less consumption of assets. Beyond that, it is obvious that the ex-GN route is the indeed the low cost route. Not only are there many fewer locomotive miles required than either Milwaukee scenario, but cost of power modification is minimal, simply adding a unit at Havre and removing at Whitefish. Repositioning (back to Havre) cost is zero because in reality such power is offset by power moving from the Pacific Northwest to BNSF's Havre shop. There is also no cost for helpers, no locomotive dwell when the helpers are not utilized, and no delay to trains waiting for helper power to be available. The ex-NP routing used by BNSF today incorporates two helper districts, both on Montana Rail Link, rather than using supplemental power anywhere en route. In spite of not adding any road power (compared to the ex-GN scenario), the number of locomotive miles is still greater. In addition, there are many additional costs associated with any helper district. The most obvious ones are keeping a large quantity of helper power and helper crews available to assist trains when they arrive at the beginning of the helper districts. Less obvious – but equally important – are locomotive dwell and train delay. Helper power, if correctly allocated, should rarely be used for another purpose. Therefore, it can go unused for long periods waiting for the next train to help. Conversely, when there are too many trains to help, the number of trains that can be helped is limited by helper power available. Case in point: Montana Rail Link at Helena. A good-case scenario for helper power is on the hill west of Helena would be one help in six hours. This includes the time to cut the helper in (as is the case on all "heavy" trains), the time to grind up the hill and over to Elliston, the time to cut the power out, the time to return to Helena, plus delay meeting trains either way. Therefore, one set of helper power at Helena can best be expected to help 4 (westward) trains in a 24-hour period, and that's if the trains to be helped arrive sufficiently spaced so the helper power is not delayed for their next help. This is especially difficult given that prior to Helena, most of the same trains need a helper at Livingston, where the trains are subject to delay for the same reason. That's why when needing to operate a large quantity of trains the best way to do it is to have locomotive power that requires no modification in the territory in question, such as is the case for the ex-GN BNSF "Northern Transcontinental" route. The summer of 2009 is proof of this method of operation. That was the year when MRL's Mullan tunnel collapsed, and was closed for the best part of month. BNSF routed all traffic via Marias Pass (the ex-GN route), including 15 "heavy" westward trains (unit train, all shuttles) and unit coal trains in one 24-hour period. Because these trains received their full complement of power at either Havre or Great Falls rather than using helper power somewhere close to the top of the pass (the steepest grade is the short 1.3 percent westward grade at Bison, between Summit and Glacier Park Station), there was no delay positioning power to enable them to move (and of course, with the minimum amount of power necessary to move westward train compared with that on Montana Rail Link, powering the trains was not a great challenge). Both Milwaukee scenarios highlight the inherent inferiority of the Milwaukee Road's Pacific Extension to be sure, yet each one sheds light on why regardless of how an "if-the-Milwaukee-Road-were-still-around-today" train would operate, it would be much more expensive than operation by BNSF. Given the widely-accepted cost for a standard locomotive (just a bit more than $1200 daily with regard to horsepower hours), in the above scenario for "full-powering" (Harlowton to Kittitas) 8 daily grain trains on the Pacific Extension and the need for 97 more locomotives in this rotation (than currently used by BNSF via Havre) would additionally mean an additional daily cost of $116,400, or just over $4,300 per grain train operated. As prohibitively expensive as the "full power" Milwaukee scenario appears, it is probably cheaper than the multiple helper scenario even though it requires more "locomotive hours." The helper scenario isn't a "pure" one because it includes additional power all the way from Harlowton to Kittitas in addition to helpers. This is because with a whopping FOUR helper grades spaced fairly far apart, it would certainly be more cost-effective to simply augment the road power at Harlowton (and it eliminates the need for a helper at Harlowton to Loweth, which historically speaking, never occurred; it also should be noted that the Loweth grade is insufficiently steep to require midtrain power). The helper scenario unfortunately, has a lot of directly unquantifiable costs. For instance, even for the five units that operated all the way from Harlowton to Kittitas, their cycle time would be dramatically increased by the trains being delayed at Piedmont and Butte and Haugan and Avery and Beverly to cut power in and out versus adding at Harlowton and cutting at Kittitas. If velocity on loaded trains was then reduced from 22 MPH to 16 MPH because of the additional stops, this would add 14 hours to the cycle time which would suggest needing to power 5 additional trains west from Harlowton before any of the power cycles back. But even that's probably not accurate because with a high-volume railroad, delays for helper power at the three helper districts (Piedmont, Haugan, Beverly) would be a given (per the current MRL operating scenario), especially considering that all the Milwaukee helper districts were as long or longer than those on the MRL. Then there's cost of manned helper operations in three places (Butte, Haugan, and Kittitas); not only the cost of multiple locomotive consists in each location, but the cost of manpower in each location (none of these were crew change points for through trains), including food, lodging, transportation, and providing relief crews as necessary from other terminals. Then there's the very hard-to-quantify cost of train delay for helpers when trains inbound at helper terminals are delayed. If trains are "bunched" they wait for helpers, further adding to locomotive (and car) cycle time. One aspect a comparison of today's BNSF and a "what it" Milwaukee Pacific Extension scenario is fuel cost. A standard shuttle grain train from Havre to Seattle on BNSF via Whitefish, Pasco, and Vancouver, WA with all power (4 units Havre to Seattle, and no power modifications en route) consumes about 12,200 gallons of fuel per train. Since it is rare that three units would operate the entire distance (one is cut, as needed, at Whitefish, Hauser Yard, or Pasco), actual consumption is usually less. Fuel use for power repositioning back to Havre for following trains is not included, though this rarely occurs since the reposition is usually occurring in the form of failed or dater power from the Pacific Northwest to the BNSF Havre locomotive facility. Using the same formulae for an estimation (as that is all that is possible now, since it's no longer in existence) of fuel use on the Milwaukee Pacific Extension – including scenario of intermediate helpers (2 units each) at Pipestone Pass, St. Paul Pass, and the Saddle Mountains, with 5 road units Harlowton to Kittitas and 3 units Kittitas to Seattle – produces a result of about 16,860 gallons, or a whopping 38% more than currently used by BNSF (with a corresponding additional cost for the Milwaukee Road operation, multiplying the number of additional gallons used by the price of fuel – nearly $14,000 more per train than the routing via Havre at $3 per gallon). Also not included in this figure is the cost of repositioning power, which would be significant, compared to the BNSF scenario; whereas BNSF is adding but one additional unit to a standard grain train (and only for 256 miles), the three-helper Milwaukee Pacific Extension scenario requires 2 such units for each train for 717 miles, plus the helper power. Considering that the quantity is twice that added to the BNSF train and the distance is 2.8 times as far, serious repositioning of power – and consumption of fuel – would be required. Some of this, of course, would be used on eastward trains that required additional power for the Milwaukee's numerous steep grades eastbound, but since these unit trains would be westbound and heavier, logically, repositioning would be required. Helper power (staged at Butte, Avery, and Beverly) fuel usage is included in the computation of fuel usage for the loaded train, but not the repositioning of the power back to the home terminal or from the home terminal to add to the train. Like repositioning road power, this helper could also be used to help an eastward train, instead of running light engine, which would therefore reduce the expense for the loaded grain train. The "fully powered" scenario (running 7 units on each train the entire distance from Harlowton to Kittitas) would be especially difficult to quantify. While fuel usage strictly for the westward grain train would be about 20 percent greater than that of the three-helper scenario (or 66 percent more than the BNSF scenario from Havre), the actual amount would be much greater due to even more power needing to be repositioned from Kittitas back east. At four units per train, at least half would be a pure reposition which would increase the amount of fuel use attributable to each grain train all that more, making this Pacific Extension scenario with a fuel usage close to double that of the current BNSF (from Havre) scenario. As information, not mentioned for fuel computation or "locomotive hours" would be the Pacific Extension scenario of running the train west of Harlowton with three road units – in a two-by-one distributed power configuration – and adding helper power en route (at Harlowton, Piedmont, Haugan, and Beverly, and cutting once over each hill). This is because such a scenario would be difficult to implement as it would require an additional helper location (Loweth), and would require large(r) amounts of helper power in multiple consists stationed at each location. The five-unit scenario from Harlowton (three-by-two configuration) avoids a helper at Loweth, and reduces subsequent helper consists to two units and when cutting helper power in midtrain, would result in the most logical configuration (i.e. most power on the head end). With regard to the three-helper (Piedmont, Haugan, and Beverly) scenario, while fuel usage for helpers is included in the fuel cost of the through grain train overall, other costs are not. For instance, if each location had three two-unit helper consists, or six units each, 18 units would be required to be stationed just for helper use. Just having these units there (whether used or not), means they could not be used elsewhere, and again assigning the $1200 per unit cost used for Horsepower Hours computation, they would cost this imaginary Milwaukee Road nearly $22,000 daily, though the cost would not be completely borne by grain trains, as helper power at these three locations could assist trains in each direction. As stated earlier, another advantage of the current BNSF scenario is no need to specifically reposition the power (1 unit) added at Havre back to Havre for subsequent trains because this is an ongoing activity with regard to shop units routinely routed there anyway from the Pacific Northwest. Great Northern and Northern Pacific built their major roundhouse facilities "at the beginning of the hill(s)" in Montana, at Havre and Livingston respectively. But not the Milwaukee Road. Their roundhouse locations were Deer Lodge and Miles City. Therefore, any power destined for the shop at those locations, if needed for westward trains at their "beginning of the hills" at Harlowton, would have to be repositioned there: Yet another inefficiency of the Milwaukee Road operation. Additionally, a comparison between the Milwaukee Pacific Extension (5 road units Harlowton to Kittitas, three beyond, with three helper districts) and current MRL/BNSF operation (3 road units with two helper districts) of this 16,000-ton train is as such: From Harlowton and Livingston respectively to Seattle, fuel consumption of the Milwaukee train (16,860 gallons of fuel) is about 20 percent more than via MRL/BNSF. The reason is not only the superiority of BNSF's water-level routing through the Cascades along its Columbia River route, but also that from the crest of the Continental Divide to the Columbia River, the MRL/BNSF route never exceeds a .8 percent grade, whereas the Milwaukee route encounters steep and curvy St. Paul Pass (1.7 percent). It should also be noted that the scenarios indicated are from their respective terminals in Montana to Seattle. With regard to fuel usage and equipment cycle time, any trains destined to any other grain terminals in the Northwest (Tacoma, Grays Harbor, Longview, Kalama, Vancouver, or Portland) would be that much less for BNSF trains since their routings traverse these areas. For Milwaukee trains, any such trains other than Seattle or Tacoma destinations, would take longer and require more fuel (and this assumes an interchange at Tacoma – to BNSF or UP - for a destination like Longview, though served by the Milwaukee, use of its 3.6 percent "Tacoma Hill" route would be exceptionally unlikely). Today, all Montana-origin shuttle grain trains are wheat and do not go to Seattle or Tacoma, but rather to Rivergate in Portland, Vancouver, Kalama, or Longview). Given the current location of shuttle facilities, such a train could originate in the Lewistown area, but would be more likely to originate in the Great Falls area. Given the circuity of the Milwaukee Road branch line network for the movement of Montana wheat (such a train from Great Falls would have to go southeast nearly 200 miles to Harlowton before heading west), and the circuity of Milwaukee Road access to ports where it would be destined, it's very likely that locomotive hours (and the corresponding "horsepower hours") and fuel costs could easily be double that of today's BNSF. And when one considers the added costs on the Milwaukee of more road crews (due to a substantially longer route) and helper power and crews (not needed at all on BNSF), the thought of the Milwaukee Road being able to provide competition with BNSF on trains of this size isn't even a myth; it's a fantasy. While the number of locomotive miles on this route is about 400 more than the BNSF routing along the Columbia River, it still substantially less than either Milwaukee Road scenario. This routing also highlights the dramatic difference between the ex-GN and Milwaukee Pacific Extension routes: Ignoring GN's full access to the SP&S, while GN had one severe grade (westbound) to Cascade Tunnel (2.2 percent), the remainder of the route and its gentle grades still made it very cost effective. In contrast, the Milwaukee Road has only one "gentle" westward grade of its major hills, Snoqualmie Pass (.7 percent), but the remainder of its climbs (1.4 percent, 2 percent, 1.7 percent, and 2.2 percent) combined to make it the most costly. Getting back to the earlier comparison: Does eight "heavy" trains in 24 hours seem unrealistic for a railroad like the Milwaukee Road? Well, of course it is, but the comparison had to be made with real-life current operation to best disprove the Milwaukee's "low-cost" operation. So what if the Milwaukee simply handled four such trains daily (and other traffic, of course)? Well, there are down sides to that, too: less revenue and increased cycle time for power due to reduced number of connections to return power being among them). Such is the vicious cycle of even trying to imagine a Milwaukee Road Pacific Extension in today's railroad world. No train approaching 16,000 tons (a standard shuttle grain train) ever operated on the Pacific Extension, and today in American railroading there is simply no other example of trains of this weight (and heavier) operating over four significant grades in 750 miles. And that one of the places it's not seen today is the Milwaukee Pacific Extension speaks volumes about why no one (with the financial wherewithal) in the 1970s sought to save it. It's also important to compare the present BNSF operation today over Stevens Pass (ex-GN main) through Cascade Tunnel and the former Milwaukee main over Snoqualmie Pass for an eastward train. This crossing of the Cascades was the only segment where the Milwaukee profile was superior, and hence the source for much of the myth of Milwaukee Road profile superiority. For the eastward comparison, trains of 10,000 tons (could be stack or general merchandise) will be used. For the sake of mileage comparison the origin is Seattle, not Interbay. Trains are run in distributed power configuration Seattle-Wenatchee with 3 units on the head end, and 2 on the rear (2.2 percent grade Skykomish to Scenic, and 1.57 percent through Cascade Tunnel to Berne); at Wenatchee, the 2 rear DP units are cut; the train continues to Essex (maximum grade is 1 percent), where a two unit helper is added to push to Summit (1.8 percent grade) and cut off. The train continues to Havre (maximum grade .8 percent), with 3 units, and since beyond Havre the maximum grade is only .6 percent, a unit is removed at Havre, continuing east with but 2 locomotives. It's true that the Milwaukee route is shorter than the ex-GN, by less than 1 percent. However, the real difference is in locomotive miles – some 23 percent more on the Milwaukee. That this train could run with 4 locomotives departing Seattle, compared to 5 on the ex-GN, is testimony to that the eastward climb up Snoqualmie Pass is 1.74 percent versus 2.2 percent on the ex- GN. But the beauty of the ex-GN route is that 40 percent of the power can be cut at Wenatchee (to be added to a similarly heavy westward train), whereas nothing can be cut on the Milwaukee route due to additional grades – just as steep – to the east. After cresting the Cascades on the Milwaukee at Snoqualmie Pass it's only a bit over 60 more miles to where a similar amount of power would be needed for the assault on the Saddle Mountains (1.6 percent), and then further east, there is the 1.7 percent climb up St. Paul Pass from Avery, and the 1.66 percent climb eastward to the Continental Divide at Pipestone Pass. At Harlowton (after utilizing the power for a grueling 50-mile 1 percent climb from Lombard to Loweth), only one locomotive can be cut. Much like the relatively unknown but power-consuming westward climb from Twin Brooks to Summit in South Dakota, the eastward trek on the Milwaukee contains a 1 percent climb out of the valley of the Little Missouri River at Marmarth, today called "Rhame Hill" which would be the ruling grade between Harlowton and Aberdeen, in stark contrast to the easy route trains on the ex-GN route encounter east of Havre: Mostly .4 percent, with a short .6 percent climb east of Williston. Like the grain train/westward example, it would be possible to help trains over the grades at Snoqualmie, the Saddle Mountains, St. Paul Pass, Pipestone Pass, and Rhame Hill to get the complement of power used on Milwaukee between helper districts more in line with that of the ex-GN; but then again, if so, one must consider the cost of helpers, helper crews, locomotive dwell when helpers were not used, and reduced velocity (delay) cutting and adding helper power at up to five locations, versus just 2 for the present day BNSF ex-GN routing. The amount of locomotive power needed on any route depends on many factors, and many are not specifically or apparently quantifiable, and are train and route specific. Overall, the route that uses the least amount of locomotive power for the longest distance with the fewest number of power modifications is the most efficient. That's why it's pretty much mind-boggling to consider all the assets that would be necessary to move a large volume of heavy trains across the former Milwaukee Road Pacific Extension, and even more so if such assets were limited, as they always seemed to be on the Milwaukee. It's much easier to consider why it's not in place anymore for real-time present-day consideration. Having established that the shortest route miles does not necessarily equate to a lower-cost operation, and that mileage to just about any point off the Milwaukee main line put the Milwaukee at disadvantage, what about the Milwaukee being the fastest in the Northern Tier? Again, it's largely a myth. Due to its shorter routing (relevant with fast passenger trains), the Milwaukee's Olympian Hiawatha regularly bested Northern Pacific's North Coast Limited between endpoints by an hour or two. But such was not the case against Great Northern's Empire Builder. 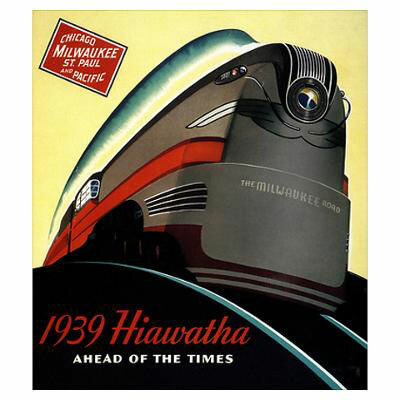 When the GN debuted the streamlined version of the Empire Builder in 1947, the Milwaukee raced to get the Olympian Hiawatha "up to speed" to compete, which it did. But not all schedules intended to compete are maintained in perpetuity. 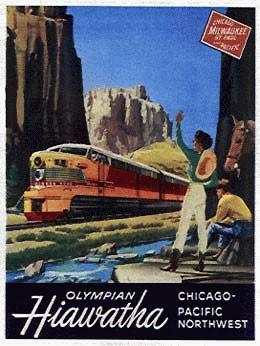 By the time the Olympian Hiawatha was discontinued in 1961, the westbound train had sagged to two hours longer running time westbound than the Empire Builder, was less than a half hour faster than the North Coast Limited (on a longer route), and was only about 2.5 hours faster between Minneapolis and Seattle than GN's second streamliner, the Western Star, that made more than twice as many intermediate stops and could be combined over part of its route with the heavy Fast Mail. It was in 1962 that (according to the July 1973 issue of TRAINS magazine) the Empire Builder posted the fastest scheduled run (ever) between Chicago and Seattle of 42 hours and 45 minutes. The Milwaukee Road did have the primary mail contracts between Chicago and the Twin Cities and onto the Pacific Northwest….but only as far as St. Paul. At St. Paul, the mail cars inbound on the Milwaukee's Fast Mail continued west not on the Milwaukee, but on Great Northern's train of the same name. Starting in the mid-1950s, Great Northern began combining the Fast Mail with the Western Star between certain stations ensuring its viability to the advent of Amtrak, while the Milwaukee's secondary Columbian was discontinued altogether in the mid-1950s, and the Milwaukee Pacific Extension was freight service only by 1964 without mail to bolster revenue. When the Milwaukee started its XL Special on the 55.5 hour schedule between Chicago's Bensenville Yard and Seattle in October 1963, it indeed was the fastest train on the route – until the schedules were matched by GN train 97 and NP train 601 (and their CB&Q connections). In 1969, for example, the fastest runs between the Twin Cities and Seattle (and vice versa) was NP trains 600 and 601 traversing the slowest and longest route, and the one with the most challenging profile. These Milwaukee and NP schedules proved a philosophy commonplace when railroads tried to compete on the basis of speed. The best example is when Denver and Rio Grande Western tried to compete with Union Pacific between Denver and Salt Lake City by running short, fast trains to achieve running time equivalency with UP's much straighter, faster route. In the end, when UP bought the Southern Pacific (which had acquired the D&RGW), the D&RGW's Denver-Salt Lake route was considered unnecessary by UP for through freight service. Speed needs to be a logical byproduct of a superior route (or one that is fantastically lucrative), or it can be a costly burden. Such was the case with the XL Special. When the XL Special was inaugurated on its "fast" schedule, the train was restricted to 3,000 tons over its entire route, and assigned 9,000 HP, usually sufficient for handling the train the entire length of the run. But even in 1963, 3,000 tons was a small train, and as train sizes grew, the worthiness of a train so heavily powered and with restricted tonnage was ultimately untenable. When the size of the train needed to increase, the schedule couldn't be maintained. By 1968, GN train 97 had its tonnage increased east of Spokane to 5,000 tons. West of Spokane - which was the only place where the train would experience grades as severe as that of the Milwaukee – the train was restricted to 3,000 tons. But east of Spokane, GN added Portland tonnage to be set out at Spokane for subsidiary SP&S. The Milwaukee, which had no direct connection to Portland at the time (any Portland traffic was given the UP at Marengo, Washington) had to keep the XL Special at its standard 3,000 tons or less throughout its run to avoid adding additional power (or assigning helpers) over its many steep grades in Montana. At this point, a reminder is in order: The MILW encountered its first grade of 1 percent west of Minneapolis in extreme Eastern South Dakota just west of Milbank, while the first such grade on the GN west of Minneapolis was halfway across Montana, just west of Havre. The Milwaukee's first westward grade of 1.4 percent (or more) was 40 miles west of Harlowton, in Central Montana whereas the first such grade on GN was nearly 40 miles west of Wenatchee on its assault of the Cascades. By 1970 and the Burlington Northern merger, BN 97 and MILW 261(the XL Special) posted similar times between Chicago and Seattle at 55.5 hours, both of which were much slower than BN's Pacific Zip which often bested its 50-hour Chicago-Seattle schedule. The Pacific Zip, born in April 1971 just before the advent of Amtrak and the discontinuance of the Western Star, began handling the mail and express off the Western Star in the Fast Mail tradition, as well as other traffic. Indeed, by the early 1970s, the Milwaukee was succumbing to the operational realities of its vastly inferior profile versus that of the mostly-ex GN routing of BN's transcontinental route. This "Evaluation of Mainline Track" was done in 1974, well into when the deterioration of the Pacific Extension had begun (for example, train 261 of April 16, which is tracked all the way from Bensenville to Tacoma, took over 71 hours, in spite of never exceeding an anemic 2,700 tons). The number of power modification points is of interest, but the most glaring inefficiency of the operation appears to be the number of crew districts – nearly twice that of the corresponding Burlington Northern train on the same route. (In 1974, BN used four road crews to handle a train from Havre to Seattle; the Milwaukee required 8 between Harlowton and Seattle, not counting the crew on the transfer run from Black River to Seattle). Clearly, if the Milwaukee was striving for "speed" (in the 1960s), run-through crews would have been initiated, an obvious component to any successful modern railroad, especially considering that most of the running times between crew change points for train 261 of 04/16/74 were much less than 6 hours. The amount of power needed over St. Paul Pass is noteworthy, also. The "3rd Westbound Test" on April 23 is for train 261 with 6,780 and 3 SD40s on the point and 2 SD40s as "booster" units. Such a train on BN could be handled with 3 SD40s from Havre to Spokane. These scenarios also suggest that, at least in this time frame, the Milwaukee chose to use large quantities of locomotive power (including Locotrol) between major terminals rather than actual helper power staged at a specific location. While large amounts of power and helpers are both costly, maintaining a high horsepower-per-ton ratio over long distances is the hallmark of a railroad with numerous steep grades not in close proximity to one another, such was the case with the Milwaukee. The power modifications are of special interest: A Little Joe added at Harlowton, cut at Avery (it could go no further under power), then and two more units added at Othello for the assault of the Saddle Mountains and its grueling 2.2 percent grade. Also interesting is that the power added at Othello was NOT cut at Kittitas or Cle Elum. Doing so was rare, even though the westward train didn't need the extra power for the crest of the Cascades at Snoqualmie Pass; but the reality is that since Snoqualmie eastward was a hefty 1.74 percent grade, power on westward trains usually run all the way through to Tacoma where it would be needed for eastward trains. This highlights a downside of not using helpers: Even if one side of the "hill" has no helper grade, additional power must be used in both directions for locomotive equalization. This is shown in the log for train Advanced 262 on April 20, where the 3700 ton train departs Tacoma with 3 units; one is cut at Othello, another is added Avery, and completely modified and Deer Lodge and Harlowton. Multiple locomotive changes add personnel and equipment cost and running time. While these "Evaluations" could be considered anecdotal, that the test were done on these trains suggests that their operation were also commonplace, too, highlighting the inefficiencies of the Milwaukee's numerous power modifications or needing to run more power longer distances to avoid the placement of helper power and crews. In summary, while the Milwaukee XL Special may have at one time have a published schedule faster than the competition, it was short-lived, and this instance does not override the vast majority of times where GN and/or BN posted the fastest passenger and freight train running times, all the while handling greater tonnage, using fewer locomotives and crews, and overall, as history has proven, doing so at less cost than that experienced on the Milwaukee. Part of the allure of the Milwaukee Western Extension even today is the boom in traffic on America's railroads following the rebound from the 2008 recession. Certainly, there would be enough traffic today to warrant a Milwaukee Road! Not only does this ignore that if capacity enhancements would be made, it would be most cost-effective to increase capacity on the most efficient routes (which for the most part did not include the Milwaukee Pacific Extension), but it also suggests that there was some type of parity between the Milwaukee Pacific Extension and carriers like BN and UP. Not the case. It's well known that Milwaukee Road infrastructure was allowed to deteriorate through the 1970s; what's even more important than that is failure to acknowledge how the Milwaukee Road almost never improved the capacity of the Pacific Extension during its short 71-year existence. Documented here is how the Milwaukee Pacific Extension would be completely unable to effectively operate the heavy trains of today based on its operational inferiority to its major competitor. Beyond that, there is the infrastructure. In 1968, the Milwaukee operated its "Golden Grain Train" between Great Falls, Montana and Longview, Washington. Obviously, one has to wonder if it made any money on a route with stiffer grades between Great Falls and Lewistown than competitor Great Northern had between Great Falls and Longview, in addition to a nearly 250-mile disadvantage in route miles. But this was a prelude to the unit grain train which is so commonplace today. The average length of a 100+car grain train operated today is about 6700 feet (varying by number of cars and the length of the locomotives). On Burlington Northern: Conrad, Ledger, Double track Shelby-Blackfoot 51 miles, except for Cut Bank Creek bridge, Browning, Spotted Robe, Bison, Double track Summit-Red Eagle/Nyack, except for short single track sections in the Nimrod(Java) and Pinnacle gantlets, Belton, Coram, Double track Conkelley-Whitefish 11 miles, Vista, Lupfer, Radnor, Brimstone, Twin Meadows, Rock Creek, Wolf Prairie, Riverview, Ripley, Libby, Kootenai Falls, Troy, Yakt, Leonia, Crossport, Bonners Ferry, Naples, Elmira, Boyer, Algoma, Cocollala, Athol, Ramsey, Rathdrum, Otis Orchards, Double track Irvin-Spokane-Sunset Jct. 10 miles, Two routes used for directional running Sunset Jct./Latah Jct. to Pasco, 144 miles, Kennewick, Yellepit, Berrian, Plymouth, Patterson, Whitcomb, McCredie, Roosevelt, Bates, Towal, Maryhill, Wishram, North Dalles, Bingen-White Salmon, Cooks, Stevenson, Skamania, Washougal, Double track McLoughlin-Portland 14 miles. MILW: Harlowton (yard, 199 miles from Great Falls), Ringling (57 miles from Harlowton), Three Forks (yard, 57 miles from Ringling), Alloy (74 miles from Three Forks), Deer Lodge (yard, 38 miles from Alloy), Bearmouth (42 miles from Deer Lodge), Iris, Bonner Jct., Frenchtown, Alberton (yard), Tarkio, Avery (85 miles from Tarkio), St. Maries (yard), Pedee, Lind (120 miles from Pedee), Warden, Othello (yard), Double track Chehalis Jct. (254 miles from Othello) to Portland, 91 miles on BN trackage rights. While the BN had already equipped its railroad to handle the longer trains of the future (in fact, there were few sidings in single track areas that couldn't already handle such trains), this was not the case on the Milwaukee, where there were long gaps between available meeting points, notably none whatsoever on Milwaukee property west of Othello in Eastern Washington! In addition, except for Great Falls to Shelby which was still dark train order operation (98 miles), the entire BN route was CTC, Double track, or two routes, each with ABS used as directional running or effectively as double track. Meeting points on BN also mostly had power switches, and much of the route had trackside equipment detectors (such as hot box detectors) for safety. The Milwaukee Road was a completely train order operation except between Black River and Tacoma and while operating on BN. ABS was in effect from Harlowton and Sorrento and from Othello to Black River (the Milwaukee helped UP signal its line between Plummer/Manito and Marengo via Spokane for use by Milwaukee passenger trains, but it never had the wherewithal – or money – to signal its own main freight route all the way from Plummer to Marengo via Malden!) Outside the limited CTC territory, there no power switches which would have been a further detriment to fluidity as railroads transitioned to cabooseless operation in the 1980s. And, the Milwaukee didn't have trackside detectors, common safety equipment available on the routes of their competitors. So, when it comes to fantasizing about what would have been necessary back in the 1970s to revive the Milwaukee Road, it's not just a question of repair what had been allowed to deteriorate, but rather the additional cost just to get the railroad on par with the competition to allow it be competitive (which it still couldn't be due to its inferior profile and route structure). Any discussion about the perceived superiority of the Milwaukee Road Pacific Extension would have to include electrification. The Milwaukee was America's longest (in terms of route miles) electrified railroad. Unfortunately for the Milwaukee, the 650 miles of electrified railroad wasn't continuous. Harlowton to Tacoma were the limits of Milwaukee electrification, some 857 miles distant. However in the middle of this section was what was known as "The Gap," some 212 miles of non-electrified territory between Avery, Idaho and Othello, Washington. For a straight across-the-board, all-parameters-are-the-same comparison, an all-electric railroad is clearly cheaper to operate than diesel. But there are clear costs with electrification which tend to erode its advantage quickly. Some are obvious, such as the cost of constructing the cantenary and its associated infrastructure and maintaining it in perpetuity. Less obvious, but more expensive is the cost of operation when all routes are not electrified. The best example of non-continuous operation was "The Gap" between Avery and Othello. The Gap skewed the benefits/costs of electrification because operation of through trains from Harlowton to Seattle or Tacoma could never be a completely electric operation; the Gap always needed diesel (or steam) power. Often (using a westward train as example), diesel power would operate through Harlowton from the east with electric power supplementing this power for numerous grades on the Milwaukee Pacific Extension. Thus, the railroad then had to maintain facilities associated with both electrification and diesel-electric operation. But the Milwaukee did operate trains with only electric locomotives, such as west from Harlowton. The inefficiency of this operation is that to operate west of Avery, diesel power would need to be available on arrival, or the train would be delayed. Once the train arrived at Othello, if desire to take advantage of the "low cost" electric operation, then power would need to changed again, and again, electric power would need to positioned well before the arrival of the train, or it would be delayed. But trains do get delayed on railroads, and that's where the costs of train delay and locomotive dwell are so relevant to an electric operation. If it is not completely electric, there are huge costs modifying power, as well as a cost for that power to wait for next assignment, or delay to the train if the power to be used is delayed arriving the terminal. Late trains equate to increased crew costs (alimony, deadheading, relief crews) and increased cost for equipment cycle time. But "what if" as is so often touted by the proponents of Pacific Extension electrification, the Gap would have been electrified? That would nice, to be sure, but that it was never done, and never would be done would be more in line with the history of the Pacific Extension, such as not extending sidings, lack of power switches, lack of trackside detectors, and inability to signal the "Other Gap" between Plummer (Sorrento) and Othello via Malden. But in the long run, the problem with electrification, even if continuous from Harlowton to Seattle and Tacoma, would be that it's still not far enough. In today's railroading, where trains run coast to coast and Canada to Mexico with the same locomotive power even if traversing multiple railroads, electrification – even 850 or so miles of it – would only be barrier, not an advantage. And, as trains got heavier, it would require more and more electric locomotives usable in a very limited area, and delays would certainly be prevalent at power modification points with other railroads. An example: A Milwaukee grain train with all electric power is en route to Portland. Because of the extremely steep graded of Tacoma Hill, delivery to destination by Milwaukee Road would not be considered, so the train would be interchanged to BN/BNSF at Tacoma or to UP at Marengo. But to maintain expected cycle time for the equipment, the connecting railroad would need to have power immediately available at interchange. Any delay in positioning this power to be ready at interchange or delay the Milwaukee getting the train to interchange limits locomotives availability and drives up equipment cycle time….and cost. And it would be similar scenario when the equipment returned to the Milwaukee empty, facing potential cost in positioning electric power. In reality, what would happen would be that connecting carriers would simply require sufficient Milwaukee Road (diesel) power to run through to destination on their railroad, and the utility of the electric operation would quickly erode. It's another chicken-or-egg scenario that we know the answer to: What came first, the knowledge that a limited electrified network was untenable so it was phased out, or that it would become a barrier to efficient operation as run through power continued to expand? The limitations on electrification also would not be limited to just foreign interchange. Try imagine the cost associated with a service interruption of 24 hours or more (derailment, for instance) just west of Harlowton. With all the eastward trains and their electric locomotives delayed reaching Harlowton due to the outage, westward trains would have to be held at Harlowton or east until the delayed power finally arrived. This would greatly exacerbate the delay for trains going both ways, including increased crew costs and equipment cycle time. The reality of today's railroading is (and generally was back in the days of the Milwaukee Pacific Extension) that the most efficient locomotive utilization is to be able to run trains from origin to destination (whether on one railroad or more) without significant power modifications en route. A limited non-diesel electric operation then becomes a high-cost alternative to the prevailing diesel-electric mode of operation elsewhere in North America. A former Burlington Northern dispatcher from the Missoula, Montana office once expressed that he loved it when Milwaukee trains would detour over BN (ex-NP). BN trains, in the BN tradition, were always minimally powered. But not Milwaukee trains, which tended to be light and overpowered due to steep grades of St. Paul Pass west of Missoula. But this also brings up another issue with an all-electric operation: When you're an all-electric operation (as the Milwaukee never was), your ability to utilize non-electrified detour routes has declined to zero. "As traffic out of Seattle continued to increase through the 1960s and into the 1970s, so did the Milwaukee Road's share of this freight. The merger of Burlington Northern in 1970 played right into the railroad's hands giving it several new traffic interchange points. During this time the CMStP&P essentially controlled the Port of Seattle as it commanded nearly 80% of its originating traffic and also held roughly 50% of the total container traffic originating from the Pacific Northwest in general. In other words, the Milwaukee Road was completely dominating freight volume between Chicago and Seattle (it also didn't hurt that the railroad could shave almost a full day off transit times compared to that of the BN)." The above is an excerpt from the section on the Milwaukee Pacific Extension from the "American Rails" website, and is probably the best example of "The Myth of Milwaukee Superiority." Impressive numbers, but that's about all they are – numbers. While specific data were not attainable, train sheets from the period indicate, on average, three Milwaukee freights daily each way on its "transcontinental" route. (This number is bolstered by a quote from Fred Hyde's The Milwaukee Road book, "Following the Milwaukee's entry into Portland as a condition of the 1970 BN merger, the Milwaukee's transcontinental business happily increased to three interdivisional time freights each way daily.") Meanwhile, Burlington Northern was running over a dozen trains each way (on either its ex-GN or ex-NP route) daily. This suggests that either the Seattle port traffic was relatively inconsequential, the Milwaukee really didn't have that share of Seattle traffic, or that BN, due to its superior route structure in the Northwest, had much of the other business….or all of the above. It should also be noted that the reason for the increase in traffic interchanged between the Southern Pacific and Milwaukee Road at Portland had little to do with the Milwaukee Road, but rather was retaliation against Burlington Northern by SP. Prior to the 1970 BN merger, Northern Pacific interchanged much of its traffic to and from California to the SP at Portland; following the merger, some of this traffic began using Burlington Northern's ex-GN "Inside Gateway" route, Western Pacific, and Santa Fe in preference to SP. It should also be noted that the number of trains operated is not always indicative of the amount of traffic being moved. Indeed, in the 1960s, the Milwaukee limited the westbound XL Special to 3,000 tons and the eastbound Thunderhawk to 4,000 tons (west of Harlowton). Due to its numerous steep grades, the Milwaukee had to reduce tonnage and increase power in order to achieve the optimum running times. Later on, as the termination of the electrified sections of the railroad eliminated available helpers at places like Beverly and Avery, the Milwaukee was forced to run more power over longer sections of the route, sometimes with distributed power (Locotrol). This made sense, because keeping helper crews and helper power in place for only three trains per day in each direction is costly. BN on the other hand, had less steep grades, ran heavier (more cost-efficient) trains, and since they ran more trains, enjoyed the economies of scale necessary to station helper power as needed (such as Essex, Helena, and Livingston). Take the Port of Seattle container traffic that the Milwaukee "so dominated" just before it went away: All will agree such traffic was insignificant compared to now, but would the Milwaukee be beneficial to moving some of this traffic today in spite of its inferior route? No, because there's not enough of it. In 2011, for example, the number of containers handled at Seattle and Tacoma was only 25% of that handled at Los Angeles and Long Beach; add the number handled at Vancouver, BC to the Seattle-Tacoma number and you only get 42% of Los Angeles-Long Beach, but there are also two additional rail carriers (CN and CP). As long as Los Angeles-Long Beach can survive with two carriers (BNSF and UP) and three routes east, Seattle-Tacoma and its two carriers and three routes east is doable. And if not, it is much more cost-effective to do what BNSF (at Cajon Pass and Abo Canyon) and UP (through Arizona and New Mexico) have done: Add infrastructure to proven cost-efficient routes. Myth 8: The Milwaukee used six sets of equipment for the Olympian Hiawatha, to ensure on time departures at origin, whereas GN and NP used only five sets of equipment for their flagship trains, risking delay. The Olympian Hiawatha (MILW), the Empire Builder (GN), and the North Coast Limited (NP) all arrived in Seattle or Tacoma early in the morning. The eastbound counterpart trains all departed eastbound that same day in the afternoon; the GN and NP planned same-day turnaround of equipment which could lead to late departures when the westbound trains were very late, and used a total of five sets of equipment due to that same-day turnabout at Seattle. The Milwaukee, to ensure there was no delay kept another (sixth) set of equipment in the rotation (laying over in Tacoma 32 hours or so rather than the 8 or less for the GN or NP trains in Seattle). Reality: The Milwaukee had to do this because it had no other spare equipment. Even when the secondary Columbian was still operating (it quit running to Seattle and Tacoma in January 1955), its heavyweight equipment could hardly be considered worthy if Olympian Hiawatha stock was not available. After January 1955, the Olympian Hiawatha was the lone passenger train the Milwaukee operated in Washington State so there were absolutely no other sources of substitute equipment. This was in in contrast to the Great Northern, for instance, which had a large pool of equipment due to running other local trains in the Pacific Northwest (3 daily to Vancouver, BC and one to Portland in 1957 as an example). But mostly, Great Northern's number two streamliner, the Western Star, was (prior to 1951) the same equipment which comprised the 1947 Empire Builder. Since the Western Star equipment had scheduled layover in Seattle of 16 to 24 hours, its equipment was available and a suitable substitute for an Empire Builder that may have needed equipment. Great Northern and Northern Pacific, which based their Pacific Northwest passenger operations out of Seattle King Street station also were known to borrow equipment from each other when the situation required. The Milwaukee had no such options. Its Olympian Hiawatha was the lone train on the Pacific Extension, and terminated at Tacoma (and not even at Tacoma Union Station, used by GN, NP, and UP); While the "sixth set" of Olympian Hiawatha equipment was in place to ensure timely eastward departures from Tacoma, it was also reflective of the inherent inefficiency and inflexibility of Milwaukee Road operations on the west end of the railroad. Myth 9: The Milwaukee Road showed foresight in discontinuing the Olympian Hiawatha in 1961 and still served the Pacific Northwest because it (the Milwaukee) handled the City of Portland between Chicago and Omaha which continued to offer service to the Pacific Northwest, while ridding itself of passenger trains to the Pacific Northwest which the GN and NP foolishly continued to operate. Reality: As air travel was becoming more and more popular, passenger train patronage for very long trips, such as Chicago to Seattle, declined. But long distance trains were still used for medium-distance trips, such as Butte to Seattle or Miles City to Minneapolis. If the City of Portland (which by 1961, didn't offer any through cars to Tacoma or Seattle) was really a substitute for the Olympian Hiawatha, then it begs the question as to why the Olympian Hiawatha had any intermediate stops between Chicago and Seattle. Milwaukee passenger service to the Pacific Northwest was discontinued because fully-allocated loses were approaching $3 million per year (in contrast, GN's Empire Builder covered its direct costs through 1966, and the cost of operation of the Western Star was ameliorated by still handling large quantities of Fast Mail cars.) The Milwaukee's trains also never had direction connections (much less through cars) to Portland (and its important Southern Pacific service to California) as did the GN and NP trains, or direct connections to Western Canada's largest city as was the case with GN trains to Vancouver, BC. Also, the Milwaukee did not correspondingly discontinue many other passenger trains proactively as was suggested with the abolishment of the Olympian Hiawatha. The Milwaukee continued to field passenger trains to such outposts as Aberdeen, South Dakota, Channing, Michigan, and Wausau, Wisconsin well into the late 1960s and early 1970s. More importantly, when the Milwaukee took over the operation of UP's Cities streamliners between Chicago and Omaha in 1955 (consisting of the City of Los Angeles, Challenger, City of San Francisco, City of Denver, and City of Portland, which were steadily consolidated over the years and were one combined train when discontinued on Amtrak day, 1971) from the Chicago and North Western, the anticipation was that with them would come reciprocal freight traffic from the UP which never materialized. But, the Milwaukee ended up spending a huge amount of money to upgrade its Chicago-Omaha main line with CTC or double track, while the Pacific Extension continued to do without. The Milwaukee even had the added expense of adding clerks in Chicago to handle reservations on the UP Cities trains! The Milwaukee operated the Cities trains (often with multiple frequencies) for sixteen years before succumbing to Amtrak. When the Milwaukee discontinued the Olympian Hiawatha in 1961, it did end service to Spokane, Seattle, and Tacoma, but the Milwaukee continued to run shortened version of the train from Minneapolis to Deer Lodge, Montana for another three years. So, while no passenger service west of Deer Lodge did reduce passenger train miles (one way) by 665 miles daily, this was more than offset by the additional 976 passenger train miles operated daily by the combined City of Los Angeles/City of San Francisco and combined City of Portland/City of Denver operating between Chicago and Omaha (not to mention also the Chicago-Omaha Arrow on the same route). Today, the Milwaukee Road across Iowa is largely abandoned, much like the Pacific Extension, and the ex-C&NW main line, void of the Cities streamliners since 1955, is UP's busy access to Chicago, a continuation of its famed "Overland" route. The discontinuance of the Olympian Hiawatha was simply a response to the reality of declining patronage in the face of air and highway competition, more than adequate rail competition, and failure to serve Portland or offer palatable connections on the west end of the run (or to anywhere west of Minneapolis). Rather than showing prescience in abandoning passenger service, the Milwaukee embraced it, and spent scarce resources on a route that yielded no benefit and that is also gone today. Also, it should be noted, that in spite of its investment in its trackage across Iowa, the "Cities" trains on the Milwaukee never met or bested the best running times on the C&NW or that of the CB&Q Denver Zephyr. Myth 10: The BN merger was the downfall of the Milwaukee Pacific Extension. Reality: Things like the "11 Gateways" and trackage rights over BN in some locations (granted as a result of the BN merger) really only showed the shortcomings of the Milwaukee because they highlighted all the places that Milwaukee needed to go but didn't. But even these "gateways" usually offered circuitous routings. (Case in point: When the Milwaukee Road gained entry into Portland, Oregon and its SP connection, SP routed much traffic to the Milwaukee – instead of BN – in retaliation for BN using the Inside Gateway (via Bieber, California) instead of interchanging to/from SP at Portland. One of the commodities was large amounts of copper ore destined for Anaconda, Montana (west of Butte). The Milwaukee had to haul the traffic on a route that was much further, slower (especially the route between Chehalis Jct. and Tacoma), steeper (BN's route had a maximum grade of 1 percent, versus three grades of 1.6 percent or more on the Milwaukee), and used more fuel and crews than the BN routing. While the Milwaukee had the traffic, did they make any money on it? Doubtful at best.) Had the BN not come to pass, the Milwaukee would have continued to have a weak branchline network west of Miles City, a challenging profile, and no direct access to Portland and Vancouver, BC. GN and NP would have continued to own SP&S and CB&Q and benefitted from doing so. Without a merged GN and NP, perhaps the remnants of the Milwaukee would have been different, such as increased focus on GN lines in South Dakota. Regardless, anything would be only be speculative. Surely the BN merger helped the GN and NP by allowing consolidation of routes (most of which were singularly superior to parallel Milwaukee Road routes), but whether competing with the GN or NP or later the BN, the Milwaukee routes (or lack thereof) were, most of the time, inferior. Myth 11: The Milwaukee Road Pacific Extension was built without being benefited by land grants. Many of the first transcontinental railroads, such as Union Pacific and Northern Pacific, were known as recipients of land grants to allow their construction. There were tremendous downsides to receiving land grants, like building into largely unsettled territory and needing to move construction material on the newly-built railroad as the railroad progressed, and even establishing communities along with necessary infrastructure like lodging, dining, and medical services. That's why the Reality is that the Milwaukee Road benefited greatly from land grants, though the amount is specifically unquantifiable. Being the last railroad built across the Northern Tier, when the Milwaukee arrived in locations such as Miles City, Great Falls, Butte, Missoula, and Ellensburg, it enjoyed the benefit of these communities already being well-established with infrastructure such as hospitals, restaurants, schools, and hotels that they didn't need to provide. While communities such as Butte were established before the arrival of any railroad, by the time the Milwaukee arrived in the early 1900s, the presence of the Northern Pacific, Great Northern, and Union Pacific were instrumental in the growth of these communities and creation of service infrastructure later used by the Milwaukee Road. But by far the most important benefit of land grant from a Milwaukee Road perspective was that it used other railroads – mostly the land grant Northern Pacific – to ship much of the materials it used to construct its new railroad. Having this parallel railroad in place saved the Milwaukee Road much expense providing a faster, cheaper, more dependable way to move what it needed to construct the Pacific Extension. A huge, yet difficult-to-quantify benefit. Myth 12: If the Milwaukee Pacific Extension could have just lasted another 30 years, it could have been used as a relief valve for the congested BNSF "Northern Transcontinental" currently the norm in the mid-2010s. Reality: Thirty years is a long time to maintain anything that isn't/wasn't needed, and was completely incapable of handling any quantities of traffic at its demise, and what entity would/should/could pay for its upkeep? Those obvious points aside, when the goal is increase capacity and train velocity, the worst investment that can be made would be one that would add capacity to, or in the case of the Milwaukee Pacific Extension, resurrect the high cost route. Instead, the most cost-effective investment is increasing capacity on the most efficient route. An example of this actually took place on BNSF from mid-2012 to mid-2014. When BNSF was flooded with new freight business in the Bakken oil boom area of Western North Dakota, the infrastructure in place could not handle all the traffic. BNSF made good use of operating traffic that would normally operate via its "Northern Transcontinental" via alternate routes. The most frequently utilized was Chicago to the Pacific Northwest via Lincoln and Alliance, Nebraska, Sheridan, Wyoming, and Missoula, Montana. Capacity on this route was available as traffic overall was still rebounding from the 2008-2009 recession, so it was an effective detour when the regular route through Minot and Williston was incapable of handling the volume. The down side, using a westward train as an example, was (due a much longer route) using about 4,000 gallons more fuel, using four more road crews, and two or three more helper crews. In addition, cycle time for locomotives and equipment was about 36 hours longer (one way) that the traditional running time via Minot and Williston. BNSF was threatened with (and did in some cases) lose business to another carrier due to the increased transit time and expense of the detour route which could, depending on the type of train, cost an additional $30,000 or more to operate than the traditional routing. If just having an alternate route (such as the Milwaukee Pacific Extension) was all that was needed to effectively handle existing business and keep it in perpetuity, then the detour route for these trains would have been sufficient. But the reality was that the additional expense of not operating the trains on the most efficient route was a huge catalyst in BNSF's infrastructure upgrades along its Northern Transcontinental route, because as long as trains are not operating on the most efficient route, risk is present that profits are marginalized or business lost altogether. Such would be the case if the Milwaukee existed as a "relief valve." In the long run, any money spent for its revival or upgrade would be better spent (as is happening) on the more-efficient route. Another aspect of this "what-if" scenario is that it works both ways. If the Milwaukee Road Pacific Extension would have survived (contrary to reality), it would be logical to assume that the route east of Terry would not have ended up in the hands of Burlington Northern. Yet, because of the ex-Great Northern trackage in that state, BN would still have a significant presence in South Dakota. Many ex-GN branches within South Dakota were abandoned and shortlined when BN took over the Milwaukee Road main lines within the state, which today allow efficient movement of unit trains via connections to ex-GN trackage to the east (places like Sioux City, Sioux Falls, and Appleton) or to ex-NP trackage at Terry. Had the Milwaukee Road remained intact to the west coast, it's a good possibility that as the marketing of agricultural products changed toward mostly unit trains, that facilities like shuttle grain elevators would have located along ex-GN trackage in South Dakota rather than along ex-Milwaukee routes that would be uncompetitive for west coast destinations due to the Milwaukee Pacific Extension's numerous steep grades and circuitous access to key ports such as Longview, Kalama, Vancouver, and Portland. Today on BNSF, unit grain trains loaded on the ex-MILW at West Milbank, South Dakota going to the west coast usually route first east to Benson, Minnesota, then via a mostly ex-GN route to Washington State to first avoid the long one percent climb from Twin Brooks, SD to Summit, but also avoid multiple helpers being used on MRL. Until the increase in traffic related to the Bakken oil boom in the vicinity of Minot, BNSF also routed shuttle grain trains loaded at former Milwaukee Road stations like Emery, Marion, Parker, Canton, and Madison (SD) east to Sioux Falls and then toward Willmar on ex-GN trackage and then west via Minot and Havre for the same reason. Were the Milwaukee Road still in place as a through railroad from South Dakota to the west coast, certainly more shuttle grain train facilities would have been built on ex-GN trackage, or on the ex-C&NW main across South Dakota where ex-GN routes could be accessed at Huron and Florence, much as BNSF provides shuttle service to numerous facilities along this route, today served by Canadian Pacific and Rapid City, Pierre, and Eastern. So these are some of the myths of the Milwaukee Road's Pacific Extension. While proponents of the Pacific Extension mysteriously attempt to explain why things turned out the way they didn't, it's really much easier to expose what they are: Myths. Even considering the Milwaukee's poor investments in passenger train infrastructure (installing ABS on the UP between Manito and Marengo, building the Gallatin Gateway Inn, adding capacity for more passenger trains across Iowa), the fact that the Milwaukee did not invest instead in improving infrastructure for freight operations on its Pacific Extension probably had less to do with its demise than that the railroad was inherently the high-cost route. More steep grades for more route miles required more crews, more power, and more fuel than the competition. Couple this with meager online business, and it was a recipe for its demise, which is "What Really Happened." Personally: Thirty plus years of managing locomotive power on BN and BNSF systemwide, including ex-Milwaukee Road trackage, and involved in equipment management / utilization / cycle time locomotive requirements for new service and alternatives for existing service. Interviews with ex-Milwaukee Road dispatchers from the Deer Lodge and Tacoma offices as well as other ex-Milwaukee Road employees. Official Guide of the Railways, 1950-1980. Milwaukee Road employee timetables and profiles. Article cross posted to: Milwaukee Road Western Extension.